Bigoli are a kind of pasta made with semolina flour (semola di grano tenero), salt, and water. They are like thick spaghetti, and similar to Tuscan pici or bringoli. The name is also used for a kind of wholewheat spaghetti typical to the town of Bassano del Grappa in the north of the Veneto and so these are also sometimes used. Normal spaghetti would works well if it’s all that you can find. 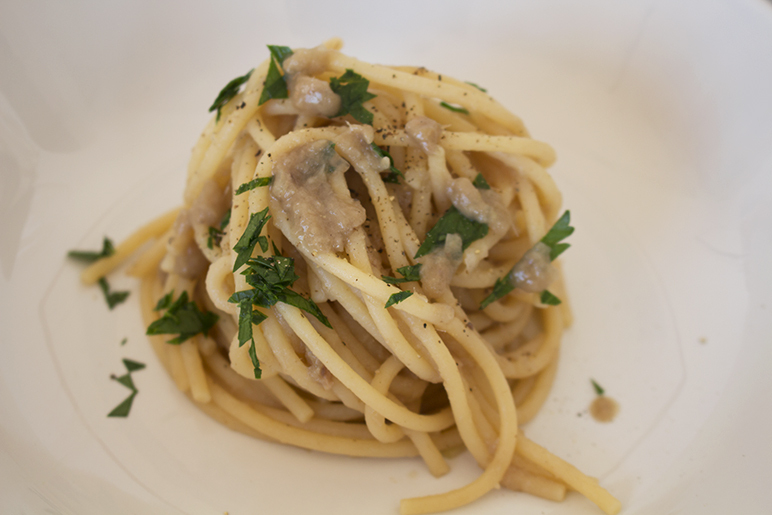 In fact, in many Venetian restaurants today, spaghetti are served as bigoli. Most letter ls are not pronounced in Venetian and so you will often see the word written as it’s said: bigoi. Salsa is the general word for sauce, but in this dish it refers to something very specific. The condiment is made from three ingredients only: white onions, water, and salted sardines or anchovies. White onions are a speciality of the town of Chioggia in the south of the Venetian lagoon. Sardines and anchovies are native to the Venetian lagoon. Although the sardine is the traditional ingredient of this dish, it really doesn’t matter which one you use. The two are very similar indeed and in Venetian have almost identical names. Sardine is sarda and anchovy sardon. A poster of fish of the Venetian lagoon and sea showing the sardine and anchovy. Let’s throw in a gratuitous shot of the dish’s home city, because … Venice! Despite its seeming simplicity, this dish is actually quite hard to make well. I’ve seen versions of it where there are pieces of onion visible which should not be the case. The onion can be quite hard to digest if it’s not cooked properly and its for this reason that the sauce takes more than an hour to prepare. But Italy is the country that invented the Slow Food movement, so its quite appropriate. Chop the onions as finely as possible. This will make them much easier to cook. Cook the onions over a very gentle heat. They should be just covered in water which you replace as soon as it’s evaporated. They should not colour but become soft and mushy. Chop the sardine/anchovy fillets as finely as possible. This will allow them to dissolve into the onion mixture. Don’t salt the water in which you cook the pasta. The sardines/anchovies are salty enough already. Garnish the final dish with finely chopped parsley and black pepper. Do not serve with grated parmesan cheese. In Italian cooking cheese is never used with pasta served with a fish sauce. Here are a few action shots of me preparing the dish so you can see how it should look at every stage. 1. Cook the onions slowly in a pan just covered with water for about an hour. Replace the water regularly. 2. After an hour the onions will have turned mushy. Mash them further with a spoon or potato masher. 3. Add the chopped sardine or anchovy fillets and stir until they have melted into the onions. 4. The finished result should look like this. So there you go. A simple but very effective pasta dish that gives you the real taste of Venice. Follow my instructions and you can’t go wrong. All that’s left is to eat it. Buon appetito! Place the onions in a large frying pan or skillet and cover with water. Cook on a low heat for one hour adding more water as it evaporates. Be careful not to colour the onion. Finely chop the sardine/anchovy fillets. Mash the onions with a spoon or potato masher and then add the fish to the pan. Stir until the fish has dissolved in the into the onion mixture. Continue to cook for about five minutes. Bring a pan with 4 litres of unsalted water to the boil. Cook the bigoli / spaghetti according to the manufacturer’s instructions. Using a slotted spoon, transfer the pasta to the frying pan with the sauce in it. Mix the pasta into the sauce, adding a little of the cooking water if necessary, and then serve topped with chopped parsley and plenty of ground black pepper. Have you ever eaten bigoli in salsa in Venice? I’d love to hear about it. I tried this when I was in Venice a few years ago. So delicious and hearty. I think I’ll have to give this one a whirl in my own kitchen…….looks marvelous. It’s one of the best pasta sauces I’ve ever tasted. It’s the tanginess caused by the salty anchovies and the white wine that I can’t get enough of! I have to confess I didn’t like this dish, which I ate in a small trattoria in Venice. This recipe brings back sweet memories from a time I was with my husband in Venice. We had this dish, one platter brought to the table to share family-style for us 2. We didn’t know it was so rich so we had also ordered antipasti, and were suffering from a little jet lag. The bigoli and the anchovy and the onion, what a perfect combination, but we had a hard time finishing the platter. The delicious crisp white wine helped 😉 and we were so satisfied after the meal. We’ve gone back to that same trattoria for fantastic meals. I’ll be in Venice next week with a group of friends, and now my mouth is watering!! I will attempt this recipe later, thank you for sharing it.